Your scientific expedition in The Forgotten Age took you far from Arkham, to the jungles of southern Mexico where you uncovered what may be the greatest scientific discovery of your time, along with a secret that defied everything you know about the history of your world. Then throughout The Forgotten Age cycle, you returned home only to learn that your actions have put everything you love in danger. Searching for answers, you journeyed to Mexico City, then back into the wilderness and beyond, to places beyond your imagination. You have faced dangers both terrestrial and otherworldly, and stood strong as the very fabric of time ripped before your eyes. 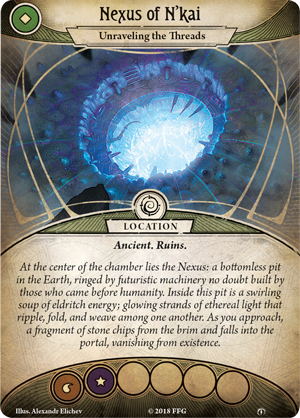 Now, you face your final test in the conclusion of The Forgotten Age cycle. 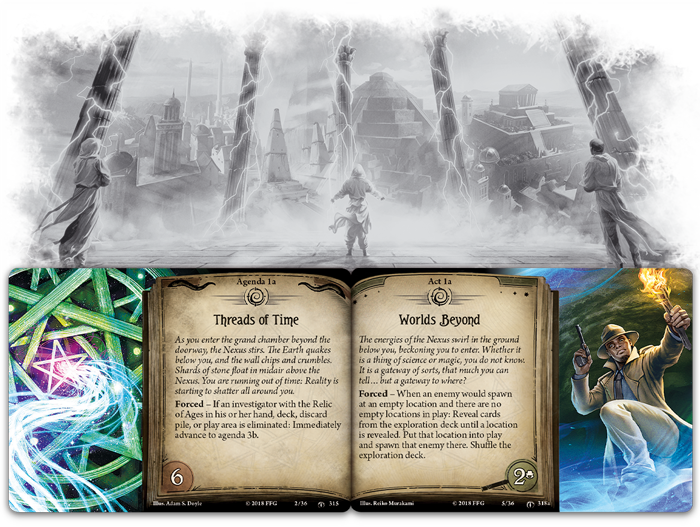 Fantasy Flight Games is proud to announce the upcoming release of Shattered Aeons, the sixth and final Mythos Pack in The Forgotten Age cycle for Arkham Horror: The Card Game— now available for pre-order at your local retailer or online through our website! 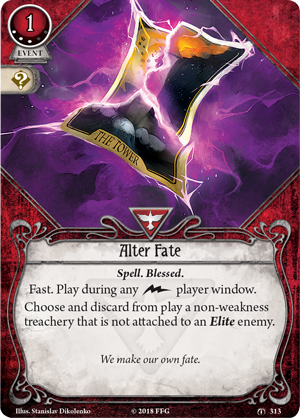 Following the events of The Depths of Yoth, hope is fleeting. What little remains burns in the bluish light emanating from the end of a passage before you. Deep beneath the Earth’s surface, you have almost forgotten the warmth of the sun, but there is no turning back for you. Whatever plan your enemies have been working toward lies ahead, and there is an unnatural power here—you can feel it in the Earth as it shakes beneath you. Pieces of the cavern start to fall, but they never reach the floor, floating in midair. The laws of reality are beginning to bend, and it cannot be long before they reach their breaking point. You must hurry. Once you reach the ancient Nexus of N'Kai (Shattered Aeons, 324), the difficulty of the task before you increases with each passing moment. 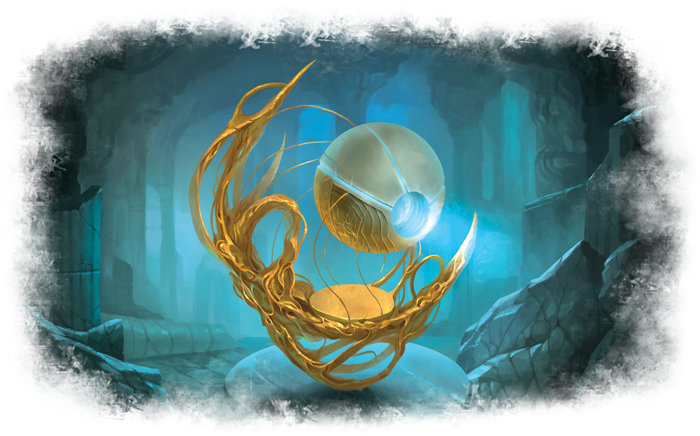 Beyond confronting beasts, like the Temporal Devourer (Shattered Aeons, 338) that chases you through time and space, you must also attempt to hold on to your mind as all that is sane falls away. Concepts of time and space cease their meaning as cities long lost to the grind of years appear anew, great metropolises of your age stand desolate, and unfathomable, unearthly expanses reveal themselves, as tangible as any city you left behind. The sight of Shattered Ages (Shattered Aeons, 339) threaten your sanity, forcing you to test your Willpower and see your knowledge and understanding sucked out into the beyond. 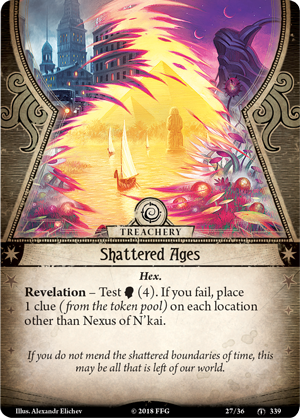 Beyond bringing you the thrilling conclusion of The Forgotten Agecycle, Shattered Aeons also provides you with a new collection of powerful player cards to prepare you for the terrors that have awaited you since you first stepped beyond the mortal realm in The Forgotten Age. 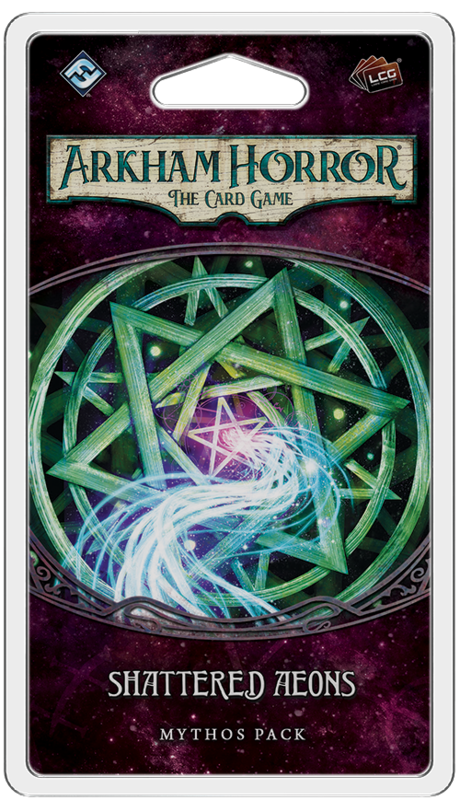 As is tradition with the grand finale of an Arkham Horror: The Card Game cycle, this Mythos Pack includes a new, powerful exceptional card to entice players. 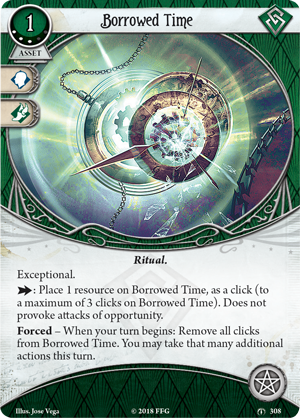 Rogues may take delight in living on Borrowed Time (Shattered Aeons, 308), storing actions to unleash in a single marvelous turn. 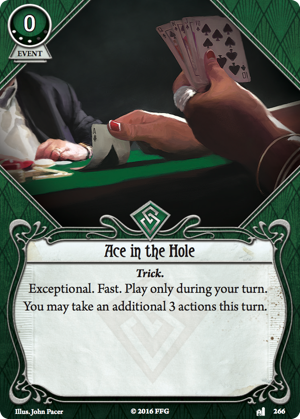 If you and Leo De Luca (Core Set, 48) have an Ace in the Hole (Where Doom Awaits, 266) to go with your Borrowed Time, you have the chance to take up to ten actions in a single turn! While Rogues may be more inclined to keep to the shadows, it may prove impossible to resist stepping into the spotlight when you can guarantee that your entire team will be impressed. But there are others who do not need the flash of exceptional cards to make their turns absolutely potent. 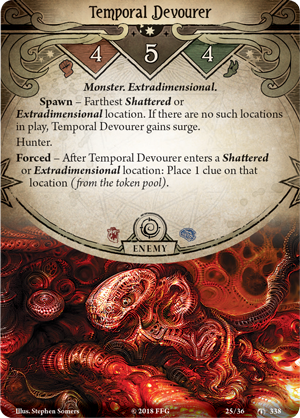 Scholastic Seekers may claw their way to an advantageous Vantage Point (Shattered Aeons, 306) to get a better lay of the locations surrounding them, making it easier for themselves or an ally to investigate. 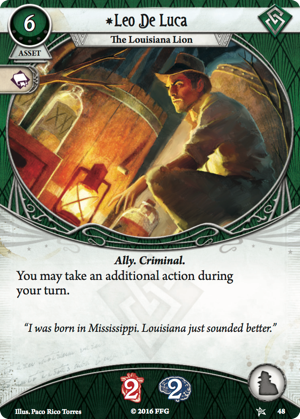 Then, even the most down-to-Earth investigators have the chance to embrace the powers of the Mythos as Survivors gain access to their first Spell with Alter Fate(Shattered Aeons, 313). 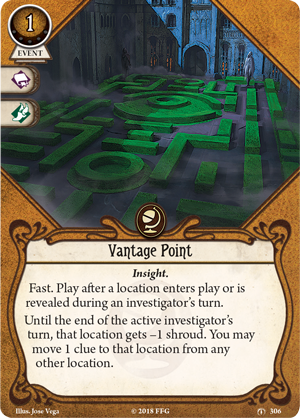 This fast event allows you to defy destiny and shape your own fate by helping you rid yourself or one of your fellow investigators of a non-weakness treachery. With the fate of all reality at stake, now is the time to pull out all the stops and examine the problem from every angle to find some kind of solution. The world is relying on you, and you cannot fail now.